Finaquant Anaytics plans to make its first product finaquant® protos -the growing prototype of a calculation engine based on table functions- available for free within several weeks. You will be able to download finaquant® protos and use it for educational and testing purposes for free (zero-priced). Like its commercial cousin finaquant® calcs planned for the end of 2012, finaquant® protos is a calculation engine (C#/.NET library) based on table functions. You can easily integrate this .NET-library with the free software development application Visual Studio Express for C# and begin to write your own procedures using the table functions in the library. Note that you don’t need to be an experienced programmer to understand and use finaquant® calcs together with Visual Studio Express. The video tutorials will show why and how. You have sufficient technical skills if you can write formulas in excel, or if you have some familiarity with matrix and vector calculations. 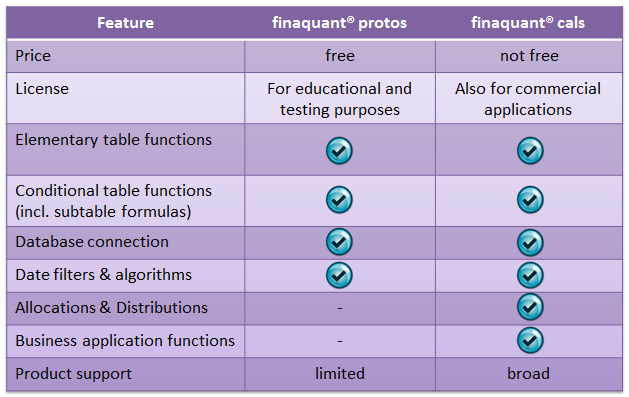 You can see a brief comparison of the features of finaquant® protos and calcs in the table above. The initial version of finaquant® protos will comprise only elementary table functions. Other features will be added step-by-step into the subsequent versions: Hence the name; the growing prototype! For any questions about finaquant® protos or cals please visit the contact page. This entry was posted in Calculation engine, Finaquant news and tagged calculation engine, products. Bookmark the permalink.